Some years ago travelling down the Talyllyn in the ex-Corris the young lad we were travelling with turned to his mum and said "I need a 'Flying Scotsman'". His mother made two points. Firstly, that he did not 'need' a "Flying Scotsman", he only 'wanted' one. Her second point was that if he took all his existing rolling stock and placed it on the track it would completely fill the main circuit line, with the resulting train literally nose-to-tail. 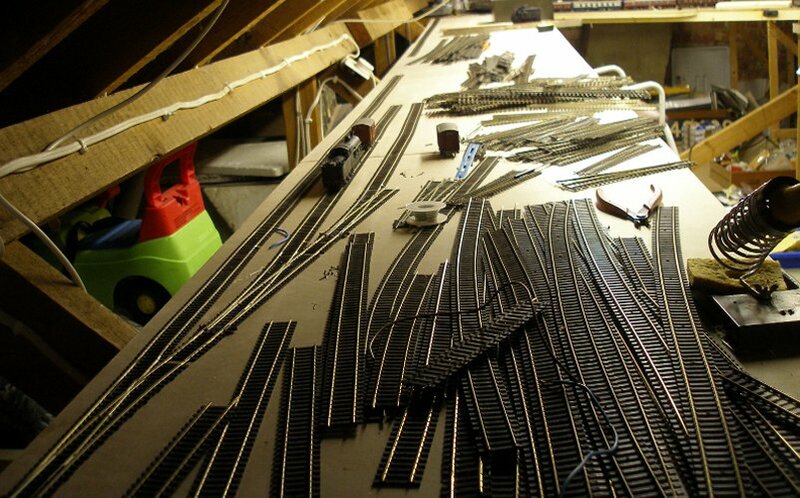 When the old layout was broken up, all the stock was carefully packed away. It was only when my old chum Jerry Chancellor came calling by the other week that finally was an effort made to clear the decks of all the construction gubins and unpack the remaining stock and attempt to assemble it in proper formations. It was only after I had more than filled the new storage sidings and still had some 20 BR Mark 1s sitting on the baseboard did it occur to me that the young gentleman's mother had a point. Actually, she was wrong on both counts: every boy NEEDS a 'Flying Scotsman', and the problem was not too much stock but not enough track. Mums...we love them dearly but there are some fundamentals they just don't seem to grasp. In fact, there was another issue. One of the signature trains for Hall Royd is the Red Bank empty newspaper vans that would rattle through at about 17:30 double headed by a couple of Black 5 or equivalents. At 22 vans and two locos, this is quite long. You don't have to be a rocket scientist or a derivatives trader to see that 22 vans won't fit a 7 foot siding. Or maybe you do. Here is the original storage siding area 'as built' - its the green painted chip board, which originally accommodated some eight roads. The back (left hand) road originally was about 7 foot long, and then each road became progressively sharper and shorter as they moved to the right. Also note the use of the two Palethorpe's six-wheeled vans to check the new layout: these would normally go via Standedge to get to Stockport and points south, but if there were problems, then Hall Royd would have been the alternative routing. I would very much like to see a snap of these vans in transit. 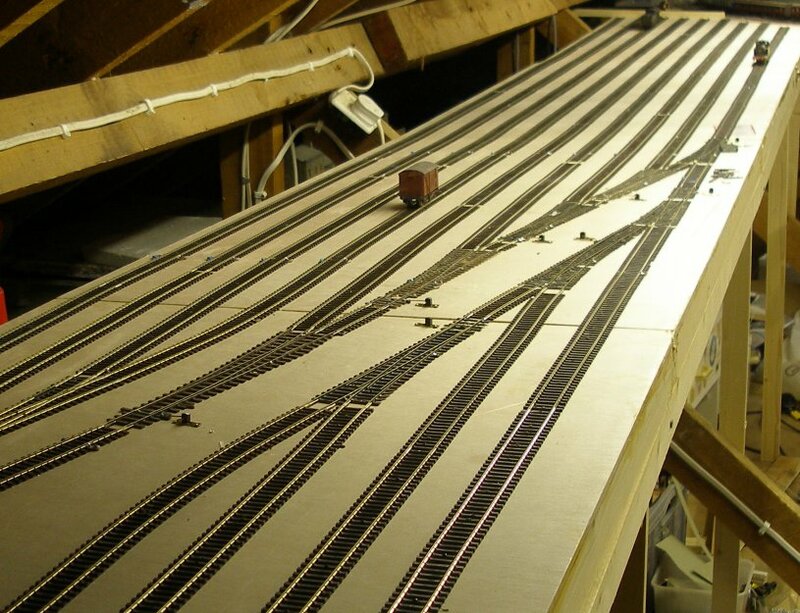 The 'solution' has been to retain the original boards, and relay two tracks to the minimum curvature to connect with four new boards. These are formed from 6-ply sheets from Wickes (I know, I know - but you should have seen the 3-ply sheets which had not been stored at all well) with 2" x 1" pine frames. These are supported on their own sub-frame, also of 2" x 1" pine, so that the boards can be easily turned on edge when the need arises for access underneath. The outer curve (close to the wall) will feed the four longest sidings which are ear-marked for the Red Bank vans, and the passenger rakes, whilst the inner track, with the vans standing on it, will feed the freight roads. The existing cross-overs in Millwood Tunnel will be used to correctly route trains, whilst the extra short roads left over from the old stabling sidings will be used for turning-back short DMUs (six-car sets will have to run forward into the yard proper). As can be seen, progress has been unusually rapid. Just 10 days after the old yard was closed, the new infrastructure is in place. As part of my never throw anything away, two lots of old Peco were recovered from various cupboards. The track in the foreground is Code 70, whilst the pile in the background is Code 100. The link Code 70 to 100, I put Code 100 fishplates onto the Code 100 track and then rest the Code 70 rail on top of the fishplate, and solder the two together. I suppose I ought to illustrate this, as it works well and saves having to buy the 70 to 100 translator track at £6 a pop. Wiring up has started, with the soldering iron and solder to hand. Already a LNWR G2 has propelled a wagon round from Hall Royd proper to check for buffer locking problems (we use three link couplings for the waggonery). At the top of the above photo is a pile of Peco Code 70, and at the bottom of the picture is a pile of Peco Code 100. The plan is to lay into the storage area in Code 70, so that all points at Code 70, and then half way down, switch to Code 100. Click here to see how the Code 70 was joined to the Code 100 without using the special Peco translator track. The image below was created on 9 April 2014 so it can been seen that it has taken 23 days to get to this point since the last update. More correctly this was achieved in 19 half-hour shifts, so just over 8 hours continuous effort. The need for a better set of storage tracks became apparent with the first running session with my good mate Jerry Chancellor. What you see here are a set of storage roads fanning out from two single tracks that connect with the set of cross-overs located in Millwood Tunnel. The tracks in the foreground are dead-enders. There was a lot of old Peco track left over from previous layouts, as the current layout uses C&L + copper-paxolin pointwork. It seemed 'pointless' not to use the Peco track, so the end of the yard closest to the camera is laid in Code 70 with copper-paxolin points, whilst from the utility van onwards the yard is laid in Code 100. This is a wonderful mix, as I have deliberately included pieces of Farish Formoway; GEM and even a piece of the old Hornby Dublo 2-rail I bought from my then next-door neighbour sometime in around 1965. The paxolin points need to have the frog power supply switched and the DPDT switches next to each tie-bar can be see set into the baseboard top. Some cosmetic sleeperwork is required. 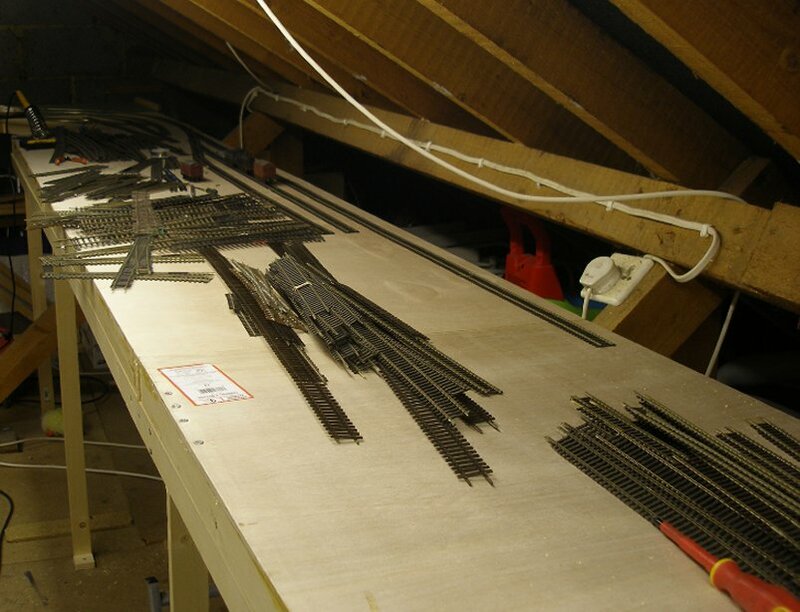 And whilst all the track is live, being a DCC layout, there now needs to be a session putting droppers in from each rail to connect with the power bus. One of the signature trains for Hall Royd is the 17:30ish empty Bank Hall newspaper van train which generally consisted of 22 bogie vans and was double-headed. Creation of the train with ALL my bogie parcels vans showed that a 16 foot road would be required. The track on the far left goes the full 16 feet. The summer slowed progress, but with the Autumn now under way, more attention has been given to extensive 'shake down' running. 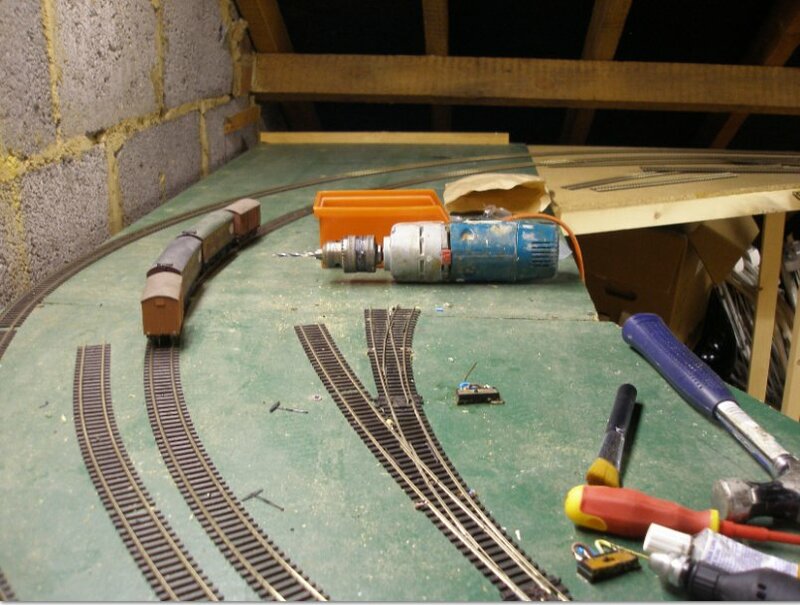 Various less than ideal points and track layouts have been addressed including - this week - the approach to the new storage yard. Previously there were two sets of Peco cross-overs in Millwood Tunnel to allow trains to switch tracks, one facing and one trailing. Originally both sets were modified for DCC, with the blade polarity modified. However a melted tie-bar when cutting the steel pin from the solenoid with a cutting disc led to replacement with unmodified points. This has led to shorting issues, particularly with long wheel-based locos. These reliability issues forced a rethink. 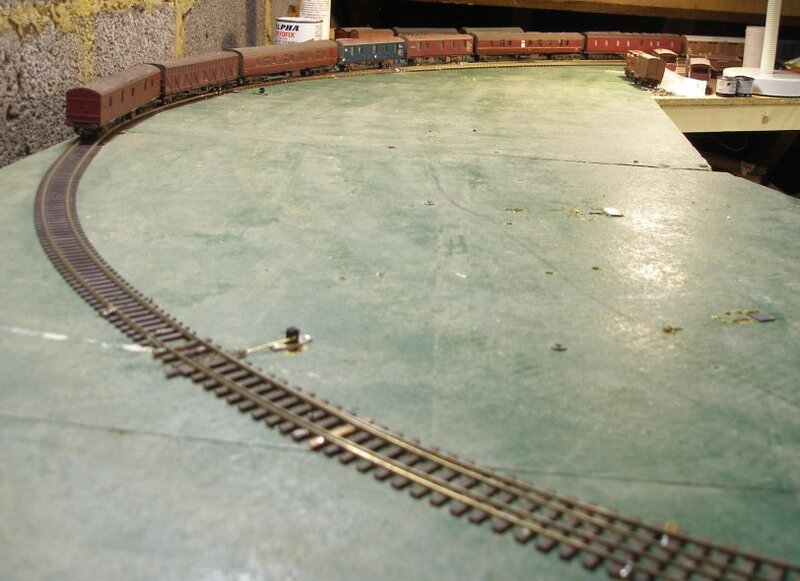 Now two curved points have been laid, providing a short length of single track before the storage yard lines start to fan out. The train is the recently arrived Red Bank empty newspaper set! 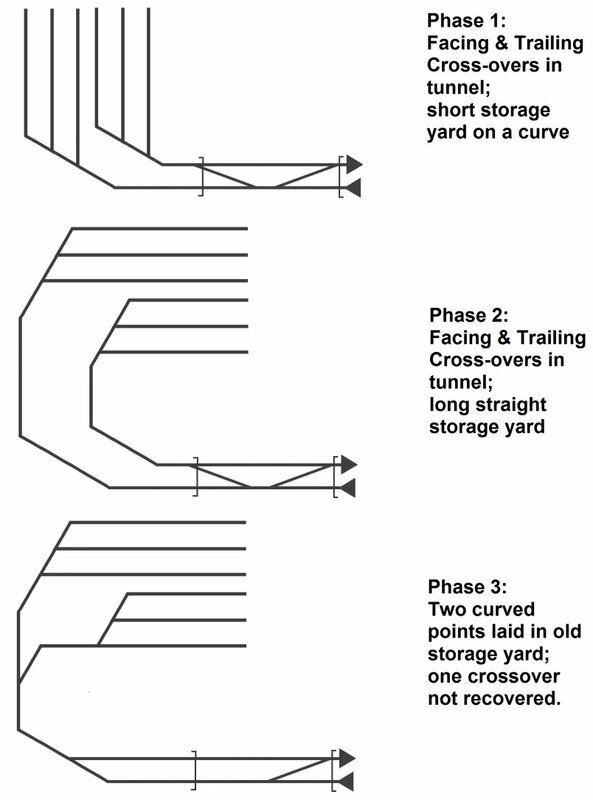 The evolution of this area is shown in the schematic plan below; the trailing crossover has been left in situ, as its location in the tunnel made recovery difficult, and set to 'straight', there are no DCC related problems.